One key to generate interest in your products or services is good presentation and design, a Wordpress photo gallery theme will put the focus on the visual, letting your images speak for themselves. Photographers often opt for minimalist designs so that the focus is on the image, together with gallery functionality so that users can easily browse and find categories. Here are a selection of WordPress photo gallery themes with plenty of neat features that we are reviewed for a client, please do let us know which you like in the comments below and share on your networks! Core Photography, cover flow front page, includes various types of photo gallery styles including thumbnail, columns and password protected areas. Great minimalist design. Showtime, versatile frontpage offering multiple slider options, features include full width thumbnail gallery and multiple column portfolio pages. PictureThis, full size page backgrounds and portfolio options. Here is one we did earlier for Marek Arcimowicz professional adventure photographer. Village, Another fullscreen background theme with unlimited slideshows, portfolios, walls, galleries and sliders available. Check out the Gallery Manager demonstration to get an idea of how it works. Chocolate, a responsive WordPress photo gallery theme, homepage setup options include 3D slider, supersized slider, classical slider, video and full screen image. Plus portfolio, photo albums, photo and blog pages. 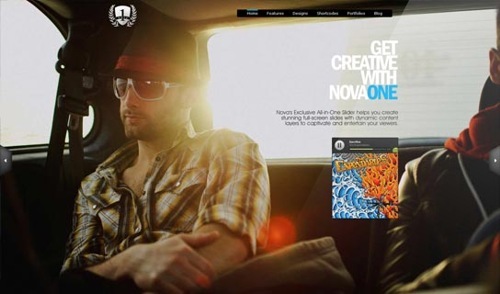 NovaFoto photography portfolio preset from ThemeNova, featuring a full-screen slider, all in one responsive layout, social media networking tools and widget suite. Photolux Photography Studio, awesome options including fullscreen backgrounds, Pinterest type sliding grid gallery, discreet menu, expanded images and more. Photocrati, aimed directly at photographers and comes with 15 different preset theme styles, each of which can be paired with four different gallery or home page styles to produce different looks. Ecommerce built in. KingSize, a fullscreen background WordPress photo gallery theme, offering multiple gallery and portfolio types including a very nifty slideviewer. Gleam, full screen portfolio section, flashy effects and popup boxes, this theme is a little different from the standard WordPress theme, though the popup boxes with scroll bars don’t do it for me. PinBlack, Pinterest type layout design ideal for photo gallery and portfolio websites. Free WordPress Theme. Eclipse, features responsive design that responds automatically to mobile devices, drag and drop elements, responsive feature slider, post or page content, and Twitter bar. Free WordPress Theme. SnapShot, home page gives you a full width slider along with a grid of all your recent photos. Free WordPress Theme. ShooterThemes, WordPress themes for photographers & creatives. Pinboard, Pinterest type grid board layout system. Available from WordPress for Free. Looks like a complete review of the contenders for photography themes.